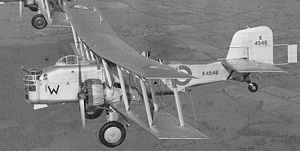 The Boulton Paul P.75 Overstrand was the last of the twin-engine biplane medium bombers of the Royal Air Force, a series that had begun during the First World War with the likes of the Vickers Vimy and Handley Page Type O. The Overstrand only saw brief service in the late 1930s and by the outbreak of the Second World War only a few surviving aircraft remained in operation with training units. The Overstrand was essentially an upgrade of Boulton & Paul's Sidestrand which had first flown in 1928 and like the Sidestrand was named for a village in Norfolk, home also of Boulton Paul's Norwich factory. The Sidestrand was similar to its First World War predecessors in that it had open cockpits and hand-operated defensive machine guns. However, unlike its predecessors, the Sidestrand could fly at 140 mph (225 km/h) making operating the exposed gun positions difficult, particularly in the aircraft's nose. To overcome this problem, the Overstrand was fitted with an enclosed and powered nose turret mounting a single Lewis gun. As such the Overstrand was the first RAF aircraft to have a power-operated turret. Rotation was handled by pneumatic motors while elevation and depression of the gun used hydraulic rams. The pilot's cockpit was also enclosed but the dorsal and ventral gun positions remained open, though shielded. The first Overstrand, at the time designated the Sidestrand Mk IV, flew in 1933, powered by two 580 hp (430 kW) Bristol Pegasus IM.3 engines, instead of the Sidestrand's 460 hp (340 kW) Bristol Jupiters, and was capable of 153 mph (246 km/h). The bombload was also increased to 1,500 lb (680 kg). The conversion was a success and three more Sidestrands were modified using the 580 hp (430 kW) Bristol Pegasus II.M3. 24 Overstrands were produced and in 1936 began replacing the Sidestrand in service. The Overstrand was operated by No. 101 Squadron RAF (which had been the sole Sidestrand squadron) and briefly by No. 144 Squadron RAF (though they were replaced by Bristol Blenheims in 1938). At the outbreak of the Second World War, 11 Overstrands remained in service and six of these were used for gunnery training. They remained in operation until May 1941 though flying was limited following the mid-air breakup of Overstrand K8173 on 22 April 1940. There were plans to develop a version with retractable undercarriage, dubbed the P.80 "Superstrand", but the project was abandoned. 11 January 1937 K4564 of 101 Squadron flew into ground in fog at Swanbourne, Buckinghamshire, three crew killed. 22 April 1940 K8173 of 101 Squadron crashed off Chesil Beach, Dorset following an engine fire, three crew killed. Halley, James J. Royal Air Force Aircraft: K1000 to K9999. Tonbridge, Kent, UK: Air-Britain (Historians) Ltd., 1976. ISBN 0-851330-048-0. Lewis, Peter. The British Bomber since 1914: Fifty Years of Design and Development. London: Putnam & Company Ltd./Fallbrook, California: Aero Publishers Inc., 1967. March, Daniel J. 'British Warplanes of World War II. Rochester, Kent, UK: Grange Books, 2000. ISBN 1-84013-391-0. Taylor, John W.R. "Boulton and Paul Overstrand". Combat Aircraft of the World from 1909 to the Present. New York: G.P. Putnam's Sons, 1969. ISBN 0-425-03633-2. Taylor, Michael J.H., ed. "Boulton Paul Overstrand".Jane's Encyclopedia of Aviation, Vol. 2. Danbury, Connecticut: Grolier Educational Corporation, 1980. ISBN 0-7106-0710-5.